One problem remained. Britain, as reigning Olympic champions was not keen that India, then its colony, participate in the Olympics. After an appeal, the British agreed to India's participation as the British Indian team. From 1928 till India won independence in 1947, Britain never competed in the same Olympic hockey tournament as India. n the first 3 modern Olympics (1896 - 1904), hockey was not one of the sports included. Hockey made its debut in the 1908 London Olympics, where England won the gold among 6 nations. 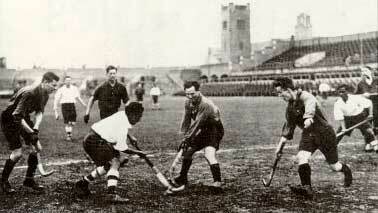 Excluded from the 1912 Olympics, hockey staged another comeback in the 1920 Antwerp Olympics. Four nations participated in the event, with England yet again winning the gold. Hockey was not included in the 1924 Paris Olympics. There was a strong possibility that hockey would be included in the 1928 Olympics. The International Hockey Federation, which was formed in this period, was lobbying the International Olympic Committee to include hockey in the Olympics. The Indian Hockey Federation (IHF), founded in 1925, was also lobbying for hockey as an Olympic sport. In preparation for that possibility, the IHF had already conducted its inaugural national championship in 1925. The successful Indian army tour of New Zealand in 1926 had convinced the IHF that an Indian team should participate in the Olympics. However, one problem remained. As England had won both the Olympic hockey tournaments held thus far, Britain was not keen that India, then its colony, participate in the Olympics. After an appeal, the British agreed to India's participation as the British Indian hockey team. It is a matter of record that from 1928 till India won independence in 1947, Britain never competed in the same Olympic hockey tournament as India. The first meeting between India and Britain would take place two decades later, in the 1948 Olympic hockey final at Wembley, London. India won this match 4-1 to assert its hockey supremacy in the world. Anyway, the IHF got to send a team for the 1928 Amsterdam Olympics. Dhyan Chand got selected in this first ever Indian Olympic hockey team. There was some alarm when the IHF said that they could send only the minimum 11 players. Eventually, the availability of funds made it possible for two more players to join the team. Before leaving for Amsterdam, the Indian team played some trial matches. The Olympians surprisingly lost to Bombay 2-3, with Dhyan Chand scoring both his team's goals. Could this first Indian Olympic team really win the Olympic gold?